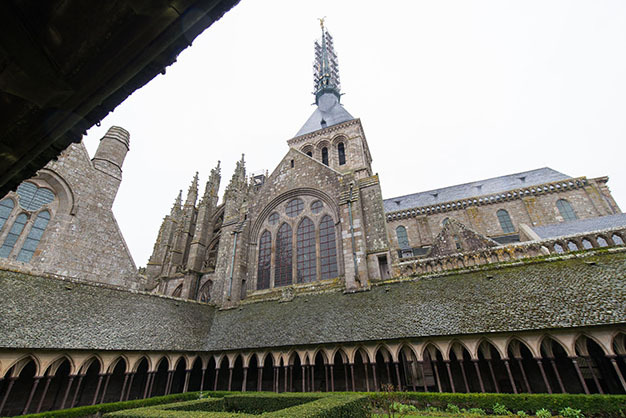 Mont-Saint-Michel Abbey: cloisters and spire. As in the whole of France, the Revolution brought about profound changes. 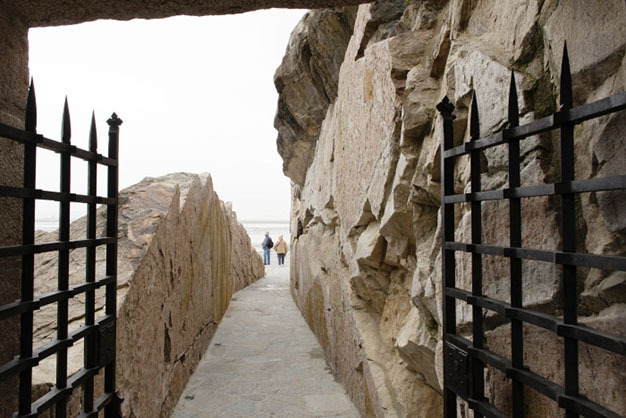 Mont-Saint-Michel, which had already known various functions, once more adapted to new uses. In 1791, the Mount, which had already lost its military status, saw the departure of the last Benedictine monks. The Abbey, now the property of the State, was converted into a prison, as the isolation of the site was ideal for this function. The site was occupied by prisoners until 1863. The buildings, which were not well maintained during this period, suffered considerably. The second half of the 19th century was therefore a period of large-scale restoration. The emergence of the concept of heritage and development of doctrine about historical monuments helped to preserve and safeguard the Abbey, and at times reinterpret the monument. In 1874, a few years after the closure of the prison in 1863, the Abbey was listed as a historical monument. Architects then began to visit the Mount. Edouard Corroyer carried out the first studies and began large-scale works to repair and consolidate the site. 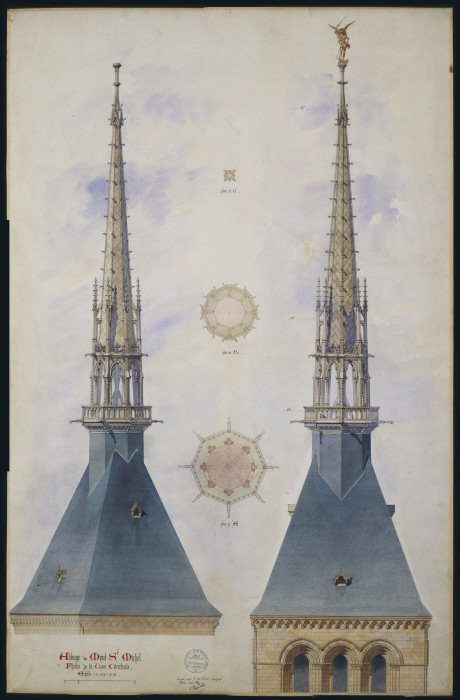 Then in the 1890s, Victor Petitgrand built the neo-Gothic spire, which was topped by a statue of the Archangel in 1897, the work of Emmanuel Frémiet. "Abbaye du Mont St Michel. Flèche de la tour centrale"
The early 20th century saw the arrival of Paul Gout, the new Chief Architect of Historical Monuments. He worked on several parts of the monument and wrote an important monograph. Another architect also made his mark on the monument: Yves-Marie Froidevaux. In the 1960s, he worked on the Pre-Romanesque church of Notre-Dame-sous-Terre. He was also responsible for the contemporary restoration of the cloister gardens. The late 20th century saw the restoration of the spire by the architect Pierre-André Lablaude, and the first removal of the archangel for restoration in 1987. This spectacular operation was repeated in early 2016 in order to achieve compliance with standards on lightning conductors, under the direction of François Jeanneau, Chief Architect of Historical Monuments in charge of Mont-Saint-Michel. Like no other site, Mont-Saint-Michel and its Abbey is a genuine icon of French heritage, famous all over the world, and has been constructed gradually over the ages, fixing its iconic shape in the changing landscape of the bay. Video of the replacement of the archangel on the top of the Abbey on 26 May 2016. Since 1979, "Mont-Saint-Michel and its bay" have been listed as a UNESCO World Heritage Site. On 16 November 1972, the World Heritage Convention brought together 190 signatory States. Ratified by France, it promotes the protection of nature and preservation of cultural assets. In 1998, a second listing as a "pilgrimage route to Santiago de Compostela, in France" emphasises the importance of Mont-Saint-Michel as one of the major attractions in the Western world, both as a tourist destination and a stopover for pilgrims. According to the principles of the Convention, heritage is universal and the whole of humanity is responsible for protecting it and transmitting it to future generations.